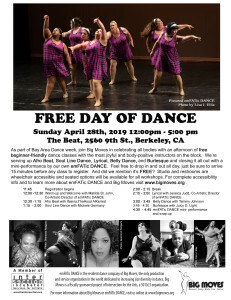 As part of Bay Area Dance Week, join Big Moves in celebrating all bodies with an afternoon of FREE beginner-friendly classes with the most joyful and body-positive instructors on the block at our annual FREE Day of Dance, Sunday April 28th, 2019 (12-5pm at The Beat in Berkeley, CA)! We’re serving up Belly Dance, Soul Line Dancing, Afro Beat, Lyrical, and Burlesque, and closing it all out with a mini-performance from our own emFATic DANCE. Feel free to drop in and out all day, just be sure to arrive 15 minutes before any class to register. And did we mention it’s FREE?